All so you can study efficiently and enter the field with confidence. A Smarter Way To Study The ready-made lessons provided by PATHPrimer give you the chance to monitor your performance as you review more than 2,450 topics. You’ll be able to easily identify your strengths and weaknesses, as well as compare yourself to others at the same professional level, so you can allocate study time where you need it most. PATHPrimer lessons include learning objectives, lesson overviews, specific diagnoses and assessment questions related to more than 2,450 pathology topics. PATHPrimer delivers the most comprehensive pathology curriculum available. The curriculum covers more than 2,450 topics across all anatomic pathology disciplines to help residents like you become competent, confident pathologists. Our team of authors is a collective of thought leaders in the field of pathology. Each consultant contributes a lifetime of subspecialty expertise to the PATHPrimer learning experience. Learners can check their knowledge and understanding of the curriculum with more than 2,200 questions covering anatomic and clinical pathology. These questions cover all primary and subspecialties of the ABP certification and recertification exams. In addition, they include information regarding general pathology, the major organ systems and ancillary diagnostic techniques, as well as important topics such as cytopathology and molecular diagnostics. Each lesson includes a set of questions designed to assess the knowledge level of the learner. 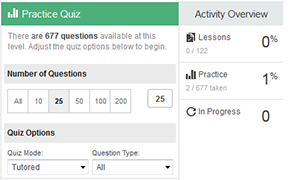 Lesson quizzes may be taken in test mode or tutored mode, the latter offering guidance and feedback in real time. In testing mode, learners answer all questions in the test without hints or learning suggestions to simulate the exam experience. Questions posed in tutored mode provide immediate tips and lead trainees back to the lesson material to strengthen their comprehension and retention. 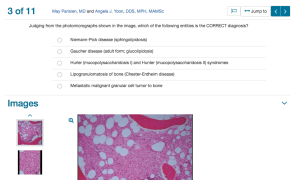 Learners can create custom quizzes to evaluate learning retention, test their skills across multiple anatomic pathology disciplines, flag questions for follow up, and select new or revisit previous questions. Ready-made lessons pull together all the information learners need to understand about a given topic. With pre- and post-tests, PATHPrimer allows learners to track progress and see how they measure up against other professionals at the same level. By identifying areas of competency and areas of weakness, the PATHPrimer curriculum allows trainees to focus their attention on specific topics to improve overall performance. Because PATHPrimer is web based and optimized for access on an iPad®, mobile digital devices or newer web browsers, users can access the curriculum any time from virtually anywhere. Can I use PATHPrimer on my mobile device? PATHPrimer is optimized for browsers that can be viewed on an iPad® and other tablet devices. Where does the content in the PATHPrimer curriculum come from? The PATHPrimer reading content comes from the award-winning Elsevier collection, Diagnostic Pathology, and was written by leading pathologists in each curriculum area. The anatomic pathology questions come from the popular Elsevier title, Anatomic Pathology Board Review, by Jay H. Lefkowitch, MD. The clinical pathology questions come from the celebrated title, Clinical Pathology Board Review, by Steven L. Spitalnik, MD. What kinds of questions are in PATHPrimer? PATHPrimer’s questions are board-style questions primarily from the Elsevier titles Anatomic Pathology Board Review, by Jay H. Lefkowitch and Clinical Pathology Board Review, by Steven L. Spitalnik, MD with an additional 200 exclusive questions found only in PATHPrimer. How many questions are in the system? PATHPrimer has nearly 2,200 challenging questions to help learners prepare for rotations, board exams, and recertification exams. Can PATHPrimer help me keep track of my progress and give me information about where I should focus my study time? Yes. The Performance window shows your overall scores in each category of the curriculum so you can easily see the areas where you excel and areas you need to revisit. Flags on missed questions and bookmarks on reading materials help you quickly go back to the information you need to study. Does PATHPrimer cover Anatomic and Clinical Pathology? Yes. The PATHPrimer curriculum includes both anatomic and clinical pathology content. What is different about PATHPrimer? 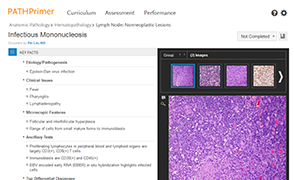 PATHPrimer provides a comprehensive pathology curriculum, organized into lessons with corresponding learning objectives and assessments for each curriculum category. In addition, PATHPrimer content was written by well-known pathologists who are thought leaders in each of their respective sub-specialties.